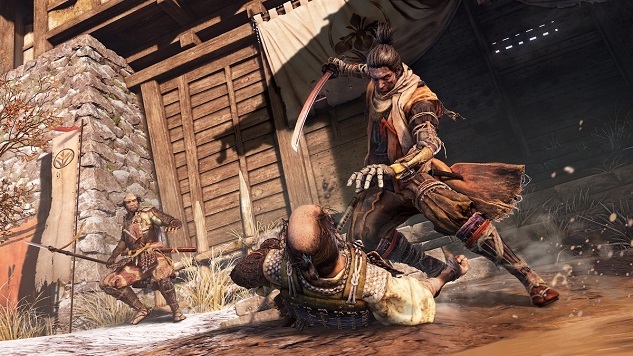 Sekiro: Shadows Die Twice’s subtitle clearly doesn’t refer to the ninja I’m playing as. That guy has died way more than two times. If there’s a counter keeping track of how many times I’ve died hidden somewhere within this game’s menus, I hope for my own sense of self-worth that I never find it. I’m the Meryl Streep of dying, but this is one award I don’t want to accept. Death is the major fascination for From Software. Like Jasper Johns and his flags, From repeatedly returns to the same topic, finding new nuances within death and trying to wring new meaning from the repeated end of their players. Their games are ornate explorations of decay and collapse, from the rotting worlds they’re set in, to the ease and frequency with which a player’s character is dispatched. From is so committed to death that they design some of the few games that intentionally make things harder for a player the worse they do. There’s a reason for all this death, though. It’s not just wanton slaughter. It isn’t just about testing a player’s skill or cultivating some kind of rep as the toughest studio in games, or anything like that. Despite how often players die in them, Sekiro and From’s other games are simply using death as a tool to highlight what’s of greater importance, both in and outside the games themselves. From approaches death the way visual artists use negative space, or how musicians use silence. It’s a stark moment of contrast puncturing the flow of a work, breaking up what comes before and after, and ensuring that both sides of that gulf feel more important than they otherwise would. Death isn’t a punishment in Sekiro, but an essential and inevitable tool that increases the player’s enjoyment and understanding of everything else that happens in the game—and those deaths have to be punitive in order for them to have that meaning. In Japan there’s a concept similar to negative space known as ma. Ma is literally nothing—a void—but within it is the possibility for literally anything. When my ninja dies once again, perhaps by missing a branch with his grappling hook, or by mistiming that move where he jumps on a spear that’s thrusting towards him and strikes back with a quick swipe of his sword, Sekiro isn’t underlining what I did wrong, or just reminding me that my actions have consequences—it’s providing me with the opportunity to once again explore the many possibilities it places in front of me, but with a little bit more wisdom and experience. These deaths also have power outside the game itself. Johns’s flag paintings both are and aren’t flags, and although Sekiro’s deaths in no way reflect the actual pain of a real death, they’re still a representation that can emotionally and intellectually impact the player. They carry the weight of death within the game’s own self-contained world, and the loss of progress, money and experience points that comes with it stings in the player’s real world, too. Although frustrating in the moment, that caesura is crucial to the game’s conception of death. From’s devotion to death isn’t morbid; they’re not exulting in childish negation like some Norwegian black metal band. Like red and white paint and newsprint plastered onto plywood, the artificiality of death in Sekiro enhances the player’s own reality, while also making them pause to consider life and death. Death is omnipresent in games and inevitable in life. It’s not like From Software is unique in making death a central facet of their games. They are unique in how much importance is imbued into that death, though, and Sekiro continues that trend. Garrett Martin edits Paste’s games and comedy sections. He also writes about music, travel, food, theme parks and more. He’s on Twitter at @grmartin. Also check out our Sekiro prayer beads location guide.